Zygmunt Bauman (19 November 1925 – 9 January 2017) was a Polish-British sociologist and philosopher. He had been living in England since 1971. 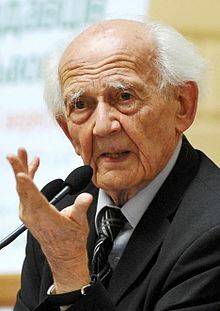 Bauman was born to a Jewish family in Poland. After World War II, he rose in the ranks of Poland's military and by the early 1950s he had become one of the youngest majors in the Polish army, but was driven out of Poland by a political purge in 1953 engineered by the Communist government of the Polish People's Republic. He was the Professor Emeritus of Sociology at the University of Leeds. Bauman was one of the world's most eminent social theorists writing on issues as diverse as modernity and the Holocaust, postmodern consumerism and liquid modernity. ↑ Bauman, Z. (2000). Liquid modernity. Cambridge: Polity. ISBN 074562409X. OCLC 749152148.